Most of us love a good horror movie, but sometimes there is more of a story behind what’s shown on screen. Of course the movies are embellished by the studios to make them scarier and more exciting, but finding out these events actually happened to people, gives the movie that extra creepy vibe! 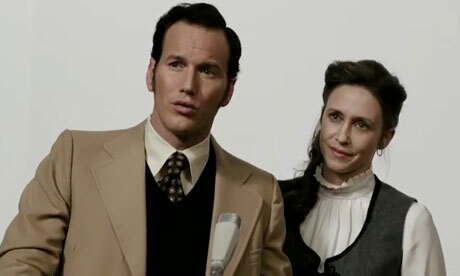 The Conjuring is ‘loosely’ based on the case files of paranormal investigators Ed and Lorraine Warren. In 1970, the Perrons, Roger and Carolyn and their 5 daughters, moved into their new farmhouse in Harrisville, Rhode Island. They started experiencing strange and disturbing events such as hauntings and spirit possessions. After 4 years of living in the house they decided to contact the Warrens. The Warrens investigated the Perron’s home and found that they were indeed being haunted. 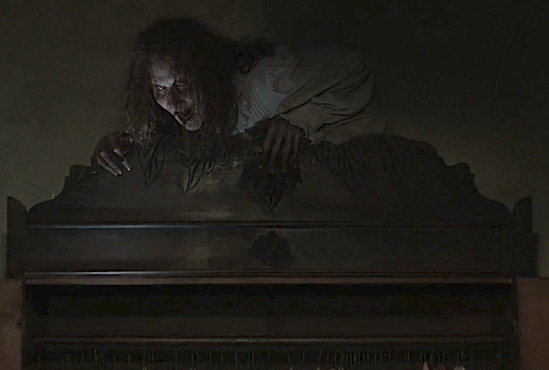 The Warrens claimed that the main entity haunting the property was a witch from the 19th century, Bathsheba Sherman. They claim she had cursed the land so that anyone who would live there after her would meet their demise. Unfortunately, the Warrens couldn’t help the Perron family and the father eventually asked them to leave. The Perrons lived in the house for 10 years, due to their children loving the house despite all of the paranormal activity. Their financial situation also stopped them from finding a new home. There are so many horror movies that are based on true stories, for example The Exorcism of Emily Rose, Open Water, The Amityville Horror, Wolf Creek and Annabelle are just a few of the many films. To find out more try having a look at the ‘Horror Movies Based on True Stories‘ Facebook group. This entry was posted in Horror movies based on true stories on June 15, 2016 by cakealiciouscakes948. Why use apps for kids? Parents may think that spending time on devices is silly and time-wasting, but computers and tablets are being used to educate children in schools for research and homework. There are many educational apps coming through to improve home learning. Using the technology is fun and can encourage learning even for the most unenthusiastic learners. There are plenty of free and easy to use apps for all ages, though the letter and number apps are generally targeted towards preschool children. As children get older there are phonetic and reading apps, maths and money skill apps to help that are based on a recommended age or the child’s year level. Do your have children that have immigrated to a new country? Kids who want to learn a second language? or even want to learn sign language? There are a variety of apps for kids to help them learn just about any language easily. Have a look at Babbles list of 10 apps to help teach your kid a foreign language. These apps are great for teaching your child how to look after the environment, they teach things like sustainability, renewable energy, growing plants and about ideas like pollution and why it’s important to recycle. Check out Mindshift and look at Know Whats Inside for a few examples of some of the different environmental apps available. These apps can help your children relax their body and mind, often helping children to fall peacefully to sleep at night.These sort of apps have easy to follow audio instructions for teaching kids how to meditate. A great example of this type of app is the Mindfulness for children the app. Of course these are all things that you can teach your kids without apps, but if the technology is available to you it could be worth a try! This entry was posted in Technology for kids on June 14, 2016 by cakealiciouscakes948. Do you want to have your cake and eat it later? Sometimes you can’t quite manage to eat the rest of your cake, or perhaps you’re saving it for a special reason like the top tier of your wedding cake. Whatever the reason here is a quick guide to help you store that leftover cake. You can leave your cake under a cake dome or an overturned bowl for 4-5 days as long as it is completely covered in butter cream or fondant icing. The icing keeps the cake moist and fresh, but covering with a bowl or dome will keep out dust and if there is children or pets around, fingers and paws out of cakes! If you have a cake that has been sliced, try to cover the exposed cake with icing to seal it, otherwise press plastic wrap directly onto the sliced part of the cake to seal and make sure that it sticks to it. If you need to store a cake for more than 5 days, or if it’s iced with cream cheese or whipped cream, it will need to go in the refrigerator. wrap as tightly as possible with plastic wrap to keep those weird fridge smells from getting to your cake. Cakes kept in the fridge will keep for 7-10 days. Also if it is a hot day, it’s probably best to keep your cake in the fridge to stop the icing from melting and to keep bacteria from growing, causing the cake to form mould quickly. To keep your cake for longer than 10 days? The traditional top tier (or piece of) of wedding cake to be eaten a year later for example. Non-iced cakes will go stale a lot quicker than iced cakes since there is no icing to keep the moisture in. A non-iced cake can be kept a room temperature for about 5 days if you completely cover tightly with plastic wrap making sure all sides are covered. Again if the house is hot it can be stored in the fridge to keep bacteria from rapidly growing. What else can you do with the leftover cake? How about a cake milkshake? Or crumble and mix with icing to make cake pops? Check out Craftsy’s Saving Cake: 15 Incredible Uses for Leftover Cake for some awesome ideas on what you could do with those leftovers. This entry was posted in Business on June 13, 2016 by cakealiciouscakes948. These stunning cakes are going viral. Why is everyone going crazy over such a simple cake? The flawless mirror finish. There’s something about the perfectly flawless cake that seems to amaze everyone, and if done right you should be able to see your reflection in the cake. Would you like to try a mirror glaze cake? We’ve found a basic Chocolate Mirror Glaze recipe for you to have a go with at home! Did this recipe work for you? Or do you have your own mirror cake glaze recipe that you would like to share? Leave us a comment and let us know!